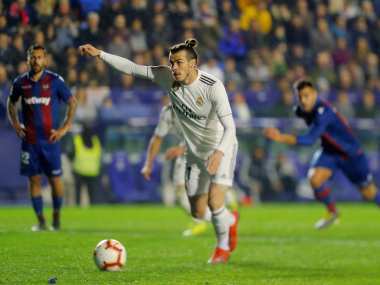 Madrid: Gareth Bale came off the bench to score a controversial winning penalty against Levante on Sunday but his refusal to celebrate suggested all may not be well again at Real Madrid. 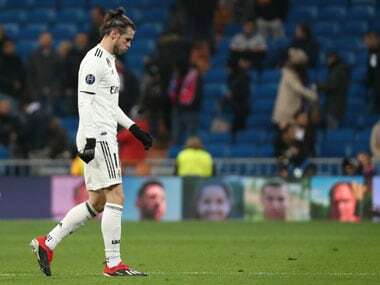 This was Bale's sixth game on the bench in the eight matches since he returned from injury and it remains to be seen if his cameo will be enough to win a start against Barcelona on Wednesday, in the semi-final of the Copa del Rey. 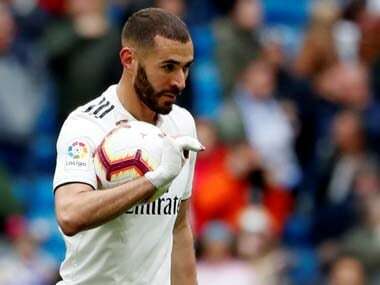 "He looked thrilled in the dressing room because he scored," added Solari. "I loved how he came into the game, the anger he played with helped, and he gave us the victory, he gave us hard work. "When we had 10 men he performed a double-job up front. For me, he had a fantastic match." Alvaro Morata scored his first Atleti goal at the Wanda Metropolitano, toasting his smart finish by poking fun at VAR, which had twice intervened to prevent him opening his account at his new club. Levante dominated for the majority of the first half but missed three golden chances. Roger was most guilty, poking onto the post from three yards out, and then nipping in behind but again hitting the woodwork, when Thibaut Courtois had left the corner open. In between, Madrid took the lead with a penalty that took everyone by surprise, brought back to a Luka Modric cross blocked by the raised arm of Enis Bardhi. It was the correct call and Benzema made no mistake. Levante had been the better side and found an equaliser just before the hour, Luis Morales squaring for Roger, who beat Nacho to the ball and expertly angled a finish into the far corner. The game was now in the balance. The lively Vinicius Junior sped in behind but was denied by the hand of Aitor Fernandez. Bale came on for Benzema and was soon called into action as Doucoure swung and missed, prompting Casemiro to tumble. Bale slid the ball into the corner. Nacho was sent off and so was Levante's Ruben Rochina on the bench, punished for protesting. 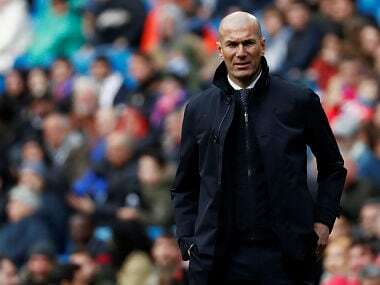 Levante deserved more but Madrid held on. Atletico's victory was more comfortable as Barcelona's closest challengers kept up the chase with a 2-0 win over Villarreal. Since joining Atletico on loan from Chelsea last month, Morata has twice had goals ruled out on review so when this one finally stood, he celebrated by imitating a referee putting a finger to his ear. "At last it came, and with a victory too, so I'm going home happy today," Morata said. "Until I saw all the officials in the stadium had given the goal, I didn't want to celebrate too much." Saul Niguez added a late second for Atletico, who sustain momentum after their brilliant win over Juventus on Wednesday in the Champions League.